As societies grew in economic and social complexity, and as isolated farms gave way to cities and villages, Europe witnessed the development of formal organizations of various types that sought to protect the economic security of their members. Probably the earliest of these organizations were guilds formed during the Middle Ages by merchants or craftsmen. Individuals who had a common trade or business banded together into mutual aid societies, or guilds. These guilds regulated production and employment and they also provided a range of benefits to their members including financial help in times of poverty or illness and contributions to help defray the expenses when a member died. Out of the tradition of the guilds emerged the friendly societies. These organizations began appearing in England in the 16th century. Again organized around a common trade or business, the friendly societies would evolve into what we now call fraternal organizations and were the forerunners of modern trade unions. In addition to the types of economic security provided by the guilds, the fraternal organizations and some trade unions would begin the practice of providing actuarially-based life insurance to their members. The friendly societies and the fraternal organizations would grow dramatically following the Industrial Revolution. By the beginning of the 19th century one of out every nine Englishmen belonged to one of these organizations. Among early U.S. fraternal organizations that we are familiar with even into the present day were: the Freemasons (which came to America in 1730); the Odd Fellows (1819); Benevolent and Protective Order of Elks (1868); Loyal Order of Moose (1888); and the Fraternal Order of Eagles (1898). As the state began to assume responsibility for economic security, the English began the development of a series of "Poor Laws" adopted to provide help to the poor, as the problem of economic security was seen primarily as a problem afflicting the poor. The English Poor Law of 1601 was the first systematic codification of English ideas about the responsibility of the state to provide for the welfare of its citizens. It provided for taxation to fund relief activities; it distinguished between the "deserving" and the "undeserving" poor; relief was local and community controlled; and almshouses were eventually established to house those on relief. The law was at once both generous and harsh. Generous in that it acknowledged the government's duty to provide for the welfare of the poor, but harsh in that it viewed the poor as highly undesirable characters and treated them accordingly. There were a series of changes and "reforms" of the "Poor Laws" over the years, but this essential structure was the tradition the pilgrims brought with them when they journeyed to the New World. When the English-speaking colonists arrived in the New World they brought with them the ideas and customs they knew in England, including the "Poor Laws." The first colonial poor laws were fashioned after those of the Poor Law of 1601. They featured local taxation to support the destitute; they discriminated between the "worthy" and the "unworthy" poor; and all relief was a local responsibility. No public institutions for the poor or standardized eligibility criteria would exist for nearly a century. It was up to local town elders to decide who was worthy of support and how that support would be provided. As colonial America grew more complex, diverse and mobile, the localized systems of poor relief were strained. The result was some limited movement to state financing and the creation of almshouses and poorhouses to "contain" the problem. For much of the 18th and 19th centuries most poverty relief was provided in the almshouses and poorhouses. Relief was made as unpleasant as possible in order to "discourage" dependency. Those receiving relief could lose their personal property, the right to vote, the right to move, and in some cases were required to wear a large "P" on their clothing to announce their status. Support outside the institutions was called "outdoor relief" and was looked upon with distrust by most citizens. It was felt that "outdoor relief" made things too easy on the poor who should be discouraged from the habit of poverty in every way possible. Nevertheless, since it was expensive to build and operate the poorhouses, and since it was relatively easy to dispense cash or in-kind support, some outdoor relief did emerge. Even so, prevailing American attitudes toward poverty relief were always skeptical and the role of government was kept to the minimum. So much so that by as late as 1915 at most only 25% of the money spent on outdoor relief was from public funds. Although the need for economic security affects all ages and classes of society, one particularly acute aspect of this need is the problem of old age and the possibility of retirement after a long life of labor. Retirement, a feature of life we now take so much for granted, was not always readily available, and it was a struggle to develop adequate systems of retirement. One of the first people to propose a scheme for retirement security that is recognizable as a forerunner of modern social insurance was Revolutionary War figure Thomas Paine. His last great pamphlet, published in the winter of 1795, was a controversial call for the establishment of a public system of economic security for the new nation. Entitled, Agrarian Justice, it called for the creation of a system whereby those inheriting property would pay a 10% inheritance tax to create a special fund out of which a one-time stipend of 15 pounds sterling would be paid to each citizen upon attaining age 21, to give them a start in life, and annual benefits of 10 pounds sterling to be paid to every person age 50 and older, to guard against poverty in old-age. The Civil War Pension program began shortly after the start of the War, with the first legislation in 1862 providing for benefits linked to disabilities "incurred as a direct consequence of . . .military duty." Widows and orphans could receive pensions equal in amount to that which would have been payable to their deceased solider if he had been disabled. In 1890 the link with service-connected disability was broken, and any disabled Civil War veteran qualified for benefits. In 1906, old-age was made a sufficient qualification for benefits. So that by 1910, Civil War veterans and their survivors enjoyed a program of disability, survivors and old-age benefits similar in some ways to the later Social Security programs. By 1910, over 90% of the remaining Civil War veterans were receiving benefits under this program, although they constituted barely .6% of the total U.S. population of that era. Civil War pensions were also an asset that attracted young wives to elderly veterans whose pensions they could inherit as the widow of a war veteran. Indeed, there were still surviving widows of Civil War veterans receiving Civil War pensions as late as 1999! But these figures based on the federal budget exaggerate the role of military pensions in providing overall economic security since the federal government's share of the economy was much smaller in earlier times. Also, there were features of the system which meant that many veterans did not receive any benefits. For example, former Confederate soldiers and their families were barred from receiving Civil War pensions. So in 1910 the per capita average military pension expenditure for residents of Ohio was $3.36 and for Indiana it was $3.90. By contrast, the per capita average for the Southern states was less than 50 cents (it was 17 cents in South Carolina). Despite the fact that America had a "social security" program in the form of Civil War pensions since 1862, this precedent did not extend itself to the general society. The expansion of these types of benefit programs to the general population, under Social Security, would have to await additional social and historical developments. Prior to the rise of company pension plans, paternalistic companies sometimes "graduated" older workers to token jobs at reduced pay. A few paid some form of retirement stipend—but only if the company was so inclined, since there were no rights to any kind of retirement benefit. Most older workers were simply dismissed when their productive years were behind them. One of the first formal company pension plans for industrial workers was introduced in 1882 by the Alfred Dolge Company, a builder of pianos and organs. Dolge withheld 1% of each workers’ pay and placed it into a pension fund, to which the company added 6% interest each year. Dolge viewed providing for older workers as being a business cost like any other, arguing that just as his company had to provide for the depreciation of its machinery, he should also "provide for the depreciation of his employees." Despite Mr. Dolge’s progressive ideas and his best intentions, the plan proved largely unsuccessful since it required a worker to spend many years in continuous employment with the company, and labor mobility, then as now, meant that relatively few workers spend their whole working career with one company. Not only was the Dolge Plan one of the first formal company pension systems in industrial America, it was also one of the first to disappear when the company went out of business a few years later. The biggest problem with company-provided pensions was that the percentage of workers anticipating an employment-related pension from their company or their union was tiny. Indeed, in 1900 there were a total of five companies in the United States (including Dolge) offering their industrial workers company-sponsored pensions. As late as 1932, only about 15% of the laborforce had any kind of potential employment-related pension. And because the pensions were often granted or withheld at the option of the employer, most of these workers would never see a retirement pension. Indeed, only about 5% of the elderly were in fact receiving retirement pensions in 1932. So the company pension was an option not available to most Americans during the time prior to the advent of Social Security. The Great Depression of the 1930s was not the only one in America's history. In fact, it was the third depression of the modern era, following previous economic collapses in the 1840s and again in the 1890s. During the depression of the 1890s unemployment was widespread and many Americans came to the realization that in an industrialized society the threat to economic security represented by unemployment could strike anyone--even those able and willing to work. 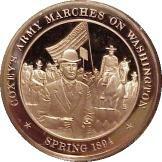 Protest movements arose--the most quixotic and notable being that of "Coxey's Army." Following the outbreak of the Great Depression, poverty among the elderly grew dramatically. The best estimates are that in 1934 over half of the elderly in America lacked sufficient income to be self-supporting. Despite this, state welfare pensions for the elderly were practically non-existent before 1930. A spurt of pension legislation was passed in the years immediately prior to passage of the Social Security Act, so that 30 states had some form of old-age pension program by 1935. However, these programs were generally inadequate and ineffective. Only about 3% of the elderly were actually receiving benefits under these states plans, and the average benefit amount was about 65 cents a day. There were many reasons for the low participation in state-run pension systems. Many elderly were reluctant to "go on welfare." Restrictive eligibility criteria kept many poor seniors from qualifying. Some jurisdictions, while having state programs on the books, failed to actually implement them. Many of the state-passed pension laws provided for counties within the state to opt to participate in the pension program. As a result, in 1929 of the six states with operating pension laws on the books only 53 of the 264 counties eligible to adopt a pension plan actually did so. After 1929, the States began enacting laws without county options. By 1932 seventeen states had old age pension laws, although none were in the south, and 87% of the money available under these laws were expended in only three states (California, Massachusetts and New York). The Industrial Revolution transformed the majority of working people from self-employed agricultural workers into wage earners working for large industrial concerns. In an agricultural society, prosperity could be easily seen to be linked to one's labor, and anyone willing to work could usually provide at least a bare subsistence for themselves and their family. But when economic income is primarily from wages, one's economic security can be threatened by factors outside one's control--such as recessions, layoffs, failed businesses, etc. Along with the shift from an agricultural to an industrial society, Americans moved from farms and small rural communities to large cities--that's where the industrial jobs were. In 1890, only 28% of the population lived in cities, by 1930 this percentage had exactly doubled, to 56%. The year 1920 was a historical tipping-point. In that year, for the first time in our nation's history, more people were living in cities than on farms. This trend toward urbanization also contributed to another significant shift in American society, the disappearance of the extended family and the rapid rise of the nuclear family. Today we tend to assume that "the family" consists of parents and children--the so-called nuclear family. For most of our history, we lived in "extended families" that included children, parents, grandparents and other relatives. The advantage of the extended family was that when a family member became too old or infirm to work, the other family members assumed responsibility for their support. But when the able-bodied left the farms to seek employment in the cities, often the parents or grandparents stayed behind. And when new immigrants first arrived in our land, it was often the breadwinner who first made the passage and only later could he bring the family over. And finally, another significant change happened in the early decades of this century. Thanks primarily to better health care and sanitation, and the development of effective public health programs, Americans began to live significantly longer. In three short decades, 1900-1930, average life spans increased by 10 years. This was the most rapid increase in life spans in recorded human history. The result was a rapid growth in the number of aged persons, to 7.8 million by 1935. The net result of this complex set of demographic and social changes was that America was older, more urban and more industrial, and fewer of its people lived on the land in extended families. The traditional strategies for the provision of economic security were becoming increasingly fragile. When the New York Stock Exchange opened on the morning of October 24, 1929, nervous traders sensed something ominous in the trading patterns. By 11:00 a.m. the market had started to plunge. Shortly after noon a group of powerful bankers met secretly at J.P. Morgan & Co. next door to the Exchange and pledged to spend $240 million of their own funds to stabilize the market. This strategy worked for a few days, but the panic broke out again the following Tuesday, when the market crashed again, and nothing could be done to stop it. As America slipped into economic depression following the Crash of 1929, unemployment exceeded 25%; about 10,000 banks failed; the Gross National Product declined from $105 billion in 1929 to only $55 billion in 1932. Compared to pre-Depression levels, net new business investment was a minus $5.8 billion in 1932. Wages paid to workers declined from $50 billion in 1929 to only $30 billion in 1932. The decade of the 1930s found America facing the worst economic crisis in its modern history. Millions of people were unemployed, two million adult men ("hobos") wandered aimlessly around the country, banks and businesses failed and the majority of the elderly in America lived in dependency. These circumstances led to many calls for change. This classic photo of a Depression-era family captured the anguish of the times. Photo by Dorothea Lange for the Resettlement Administration-1936. Huey Long was Governor of Louisiana from 1928 to 1932 and was elected to the U.S. Senate in 1930. A nominal Democrat, Huey Long was a radical populist. He wanted the government to confiscate the wealth of the nation's rich and privileged. He called his program Share Our Wealth. It called upon the federal government to guarantee every family in the nation an annual income of $5,000, so they could have the necessities of life, including a home, a job, a radio and an automobile. He also proposed limiting private fortunes to $50 million, legacies to $5 million, and annual incomes to $1 million. Everyone over age 60 would receive an old-age pension. His slogan was "Every Man A King." The Share Our Wealth program immediately became a movement. Clubs were formed in every state in the nation. By 1935 the movement claimed 27,000 local clubs with 7.7 million members. Francis E. Townsend was a lean, bespectacled doctor from Long Beach, California. In 1933 he found himself unemployed at age 66 with no savings and no prospects. This experience galvanized him to become the self-proclaimed champion of the cause of the elderly. He devised a plan known as the Townsend Old Age Revolving Pension Plan, or Townsend Plan for short. "their past life is free from habitual criminality;"
the money had to be spent within the U.S. by the pensioner within 30 days of receipt. Dr. Townsend published his plan in a local Long Beach newspaper in early 1933 and within about two years there were 7,000 Townsend Clubs around the country with more than 2.2 million members actively working to make the Townsend Plan the nation's old-age pension system. Following the passage of the Social Security Act in 1935, most of these alternative pension schemes disappeared as quickly as they had arisen. The Townsend Plan, however, hung around at least until the passage of the 1950 Amendments to the Social Security program, which made benefits much more generous and finally took the last of the steam out of the Townsend movement. But as late as November 1949, in the House of Representatives 179 members signed a discharge petition to force a floor vote on the Townsend Plan--barely 39 members short of the number needed to force the House to consider the final version of the Townsend Plan as a replacement for the Social Security system. Another influence on Depression-era public policy was the Union for Social Justice movement led by a radio preacher by the name of Father Charles E. Coughlin. Father Coughlin had a weekly radio program with 35-40 million listeners which he used to mix a little religion with a lot of politics. His enemies, in addition to the devil himself, were Roosevelt, international bankers, communists, and labor unions, and he was not shy in describing them in interchangeable terms. At the height of his popularity, Father Coughlin had a greater share of the weekly broadcast audience than Howard Stern, Rush Limbaugh, Paul Harvey and Larry King combined. Although Father Coughlin's main effort was to pillory his enemies, he did have a broad program of social reforms that included a deliberate inflation of the currency and the nationalization of all banks. He was also an anti-Semite and isolationist whose views were so extreme that the Catholic Church finally censured him and forced him to cease his political activities. In 1936, Coughlin, along with Townsend and the remnants of Huey Long's Share the Wealth Movement, would join to form a third party to contest the presidential election in the hopes of preventing President Roosevelt from being re-elected. Upton Sinclair was a famous novelist and social crusader from California , and an avowed Socialist, who in 1933 was asked by a dissident group of Los Angeles Democrats to help them draft a platform proposal for dealing with the state's economic problems. They were so impressed by Sinclair's plan--which he christened the End Poverty in California, or EPIC plan--that they persuaded him to change his registration to Democratic and to run for the party's nomination for governor in 1934. Sinclair's EPIC scheme was a 12-point program to remake the Californian economy. It involved the issuance of scrip currency, the creation of large state-run bartering enterprises, a tax on idle land and floating a large state bond for $300 million. Point 10 of the plan was a proposal to give pensions of $50 a month to all needy persons over 60 who had lived in California for at least three years. There was a state pension plan in operation in California at the time, but its benefits were very low, and the eligibility requirements were so severe that most elderly Californians could not qualify. (This was true of many of the state pension programs around the country.) Sinclair's pension proposal was very popular because in one fell swoop it reduced the minimum age for pensions by 10 years, almost doubled their value, and eliminated restrictive eligibility requirements. Sinclair's EPIC program, and especially its pension proposal, had a great appeal in Depression-weary California. Sinclair and his supporters organized EPIC clubs, published newsletters, formed ad hoc organizations and found a large chorus of supporters with unlimited enthusiasm for his ideas. In short order, Upton Sinclair's EPIC movement captured the Democratic party and Sinclair became the Democratic nominee for governor in the election of 1934. The party's platform became the EPIC program, including the pension plan. When the votes were counted, Upton Sinclair got 37% of the vote, the Republican candidate got 48% and a third-party progressive candidate took another 13%. Had it been a two-man race, Upton Sinclair might have become Governor of California and the EPIC pension plan might well have become the California model. LET'S GET OUR THIRTY DOLLARS"
The Ham & Eggs movement had more than 300,000 members--and many more supporters. In 1938 the successful Democratic candidate for governor, Culbert Olsen, openly supported the plan and a proposition was placed on the ballot to adopt the Ham & Eggs plan as California state policy. The proposition was narrowly defeated by a vote of 1,143,670 in favor to 1,398,999 against. The Ham & Eggs movement was based on dubious economics, it was founded and run by a succession of characters of questionable integrity, it suffered from internecine rivalries and frequent scandals, and yet, at the peak of its influence in 1938, more than a million Californians, including the state's Governor, believed that it was the solution to the problem of income security for the aged. That such a poor candidate for a public policy would be so widely embraced is strong evidence of how hungry the public was for action to address the problem of income security for the elderly. In Ohio, Reverend Herbert S. Bigelow initiated a proposed State amendment to guarantee an income of $50 a month ($80 for married couples living together) to those over sixty years of age who were without gainful employment. This particular plan was to be financed partly out of an increased tax on real estate (2% hike on land valued at more than $20,000 an acre), and partly out of an income tax equal to one-fourth the federal income tax paid by individuals and corporations. The Bigelow pension plan garnered nearly half a million voters before it was defeated. As some experts of the time calculated, the plan would cost more than the existing state budget for two years. A woman in South Carolina scrawls a note to a man in Washington whom she addresses as "Dear Mr. President." "I'm 72 years old and have no one to take care of me." Another letter comes to the White House from Virginia. "I'm a 60 year-old widow greatly in need of medical aid, food and fuel, I pray that you would have pity on me." Letters such as these came by the thousands from old folks across the country to the President, to Mrs. Roosevelt, to almost every one in Washington whose name was familiar to them. It isn't any wonder then, why the elderly looked to the various organizations that sprang up around the country offering salvation in some form of an old-age pension plan. One such organization was the General Welfare Federation of America. Headquartered in Washington, DC, and founded by Arthur L. Johnson, who denounced the newly established Social Security Act as a "great American fraud." He was just as severe in attacking other organizations such as the Townsend, Ham-and-Eggs, and Bigelow plans as "crackpot" pension schemes. Mr. Johnson's plan, like most of the others, wiped out the elaborate system of employment records kept under the present Social Security Act. Instead, it provided for a pension to every citizen on or after reaching the age of 60, with the simple stipulation that they not engage in gainful employment, that they spend their pension for American goods and services, and that they not maintain able-bodied male dependents between the ages of 30 and 60. The pension would be fixed at not less than $30 a month and not more than $60 a month. The actual amount would be determined by dividing the total funds available by the total number of annuitants. The funds would be derived from a gross income tax of 2 percent on individuals and corporations, with exceptions to protect charitable, religious, cooperative and similar organizations. The proponents of the this plan did manage did get it introduced in the House of Representatives, however, the bill died in committee in 1939 before ever reaching a House vote. Out of America's fascination with technology came another eccentric "reform" movement known as Technocracy. 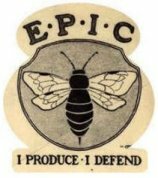 Founded in 1918 by a California patent attorney it would briefly flare as a serious intellectual movement centered around Columbia University; although as a mass-movement its real center was California where it claimed half a million members in 1934. Technocracy counted among its admirers such men as the novelist H.G. Wells, the author Theodore Dreiser and the economist Thorstein Veblen. Technocracy held that all politics and all economic arrangements based on the "Price System" (i.e., based on traditional economic theory) were antiquated and that the only hope of building a successful modern world was to let engineers and other technology experts run the country on engineering principles. Technocracy's rallying cry was "production for use," which was meant as a contrast to production for profit in the capitalist system. Production for use became a slogan for many of the radical-left movements of the era. Upton Sinclair, among others, affirmed his belief in "production for use" and the Technocrats briefly made common cause with Sinclair, and even Huey Long, in California. But the Technocrats were not of the political left, as they held every political and economic system, from the left to the right, to be unsound. The Technocrats believed that the solution to all problems of economic security were the same, the rigorous application of engineering principles in a system freed from the Price System. They conceived of retirement as being made possible at age 45 for everyone due to the vast prosperity the new age of Technocracy would usher in. Rejecting all forms of traditional political science, the Technocrats refused to even use standard geographical maps because their boundaries were political, so they would refer to states only by their geographical coordinates. Names, too, were suspect for some reason so members of the movement in California were designated only by numbers. A speaker at one California rally was introduced only as 1x1809x56! Oddly enough, alone among this collection of radical movements of the 1930s, the Technocracy movement survives, if not quite thrives, into the present day. Sign on outskirts of Depression-era town proclaims regular Monday meeting of the local branch of Technocracy. Note the use of the ancient Chinese Yin/Yang symbol as a Technocracy emblem. Library of Congress photo. The classic 1941 Frank Capra film "Meet John Doe," staring Gary Cooper and Barbara Stanwyck, depicts this period of quixotic mass movements through the story of a fictional "John Doe" who represents an amalgam of many of the ideas of these various movements. If America was to avoid the siren songs of the "radical calls to action," responsible political leaders would need to offer some persuasive alternatives. As the Depression grew, three general approaches emerged: do nothing; rely on voluntary charity; and expand welfare benefits for those hardest hit by the Depression. It seemed to many politicians and leading public figures that the Depression was just another dip in the economic cycle and that it would right itself soon enough. These voices counseled a restrained response, or no response at all. In the early aftermath of the stock market crash such views were especially common. This view that nothing very much was wrong and nothing very much needed to be done, began to fade quickly as the Depression deepened. Even so, it held considerable sway in the early years after The Crash. President Hoover had a distinguished career before becoming president. He made a name for himself in international relief efforts before and after World War I. He helped feed millions of starving people, through the efforts of voluntary partnerships of government, business and private giving. He knew this kind of "volunteerism" worked, on a massive scale, and he saw no reason why it should not work to solve the problems of the Depression. So although he engaged in some limited federal relief efforts, his main response to the Depression was to advocate voluntary efforts, which never materialized. The main problem with this strategy was that America was able to help rebuild Europe in the aftermath of World War I because America's economy was basically sound. In the Depression the total wealth of the nation was cut in half during the first three years after The Crash. This made voluntary charity a difficult ideal to achieve. Even before the Depression hit, the States had been forced to deal with the problems of economic security in a wage-based, industrial economy. Workers Compensation programs were established at the state level before Social Security, and there were state welfare programs for the elderly in place before Social Security. Prior to Social Security, the main strategy for providing economic security to the elderly, in the face of the demographic changes discussed above, was to provide various forms of old-age "pensions." These were welfare programs, eligibility for which was based on proof of financial need. By 1934, most states had such "pension" plans. Even at the state level, however, these plans were inadequate. Some had restrictive eligibility criteria which resulted in many of the elderly being unable to qualify. The most generous plan paid a maximum of $1 per day. In the Congress, the consensus of conventional wisdom was for more old-age assistance like that available in the states. With the coming to office of President Roosevelt in 1932, and the introduction of his economic security proposal based on social insurance rather than welfare assistance, the debate changed. It was no longer a choice between radical changes and old approaches that no longer seemed to work. The "new" idea of social insurance, which was already widespread in Europe, would become an innovative alternative. Social insurance, as conceived by President Roosevelt, would address the permanent problem of economic security for the elderly by creating a work-related, contributory system in which workers would provide for their own future economic security through taxes paid while employed. Thus it was an alternative both to reliance on welfare and to radical changes in our capitalist system. In the context of its time, it can be seen as a moderately conservative, yet activist, response to the challenges of the Depression. Bismarck The Social Security program that would eventually be adopted in late 1935 relied for its core principles on the concept of "social insurance." Social insurance was a respectable and serious intellectual tradition that began in Europe in the 19th century and was an expression of a European social welfare tradition. It was first adopted in Germany in 1889 at the urging of the famous Chancellor, Otto von Bismarck. Indeed, by the time America adopted social insurance in 1935, there were 34 nations already operating some form of social insurance program(about 20 of these were contributory programs like Social Security). Philosophically, social insurance emphasized government-sponsored efforts to provide for the economic security of its citizens. The tradition of social insurance would come to be seen as the reasonable, practical alternative to the radical calls to action represented by Townsend, Long, Sinclair and the others. Although the definition of social insurance can vary considerably in its particulars, its basic features are: the insurance principle under which a group of persons are "insured" in some way against a defined risk, and a social element which usually means that the program is shaped in part by broader social objectives, rather than being shaped solely by the self-interest of the individual participants. Social insurance coverage can be provided for a number of different types of insured conditions, from disability and death to old-age or unemployment. We may find it obvious to think of death, disability or unemployment as conditions causing loss of income and which can be ameliorated by pooling of risk. It is at first a little odd to think of old-age or retirement in these same terms. But that is precisely how the early social insurance theorists conceived of retirement, as producing a loss of income due to cessation of work activity. "As changing economic conditions are rendering the dependence of old people on their descendants for support increasingly precarious, so, on the other hand, new obstacles are arising to providing for old age through voluntary saving. . . The proper method of safeguarding old age is clearly through some plan of insurance. . . for every wage earner to attempt to save enough by himself to provide for his old age is needlessly costly. The intelligent course is for him to combine with other wage earners to accumulate a common fund out of which old-age annuities may be paid to those who live long enough to need it." "We must protect the crushable elements at the base of our present industrial structure...it is abnormal for any industry to throw back upon the community the human wreckage due to its wear and tear, and the hazards of sickness, accident, invalidism, involuntary unemployment, and old age should be provided for through insurance." TR would succeed in having a plank adopted in the Progressive Party platform that stated: "We pledge ourselves to work unceasingly in state and nation for: . . .The protection of home life against the hazards of sickness, irregular employment, and old age through the adoption of a system of social insurance adapted to American use." So as 1934 dawned the nation was deep in the throes of the Depression. Confidence in the old institutions was shaken. Social changes that started with the Industrial Revolution had long ago passed the point of no return. The traditional sources of economic security: assets; labor; family; and charity, had all failed in one degree or another. Radical proposals for action were springing like weeds from the soil of the nation's discontent. President Franklin Roosevelt would choose the social insurance approach as the "cornerstone" of his attempts to deal with the problem of economic security. On June 8, 1934, President Franklin D. Roosevelt, in a message to the Congress, announced his intention to provide a program for Social Security. Subsequently, the President created by Executive Order the Committee on Economic Security, which was composed of five top cabinet-level officials. The committee was instructed to study the entire problem of economic insecurity and to make recommendations that would serve as the basis for legislative consideration by the Congress. The CES assembled a small staff of experts borrowed from other federal agencies and immediately set to work. In November 1934 the CES sponsored the first-ever national town-hall forum on Social Security. The CES did a comprehensive study of the whole issue of economic security in America, along with an analysis of the European experience with these perennial problems. Their full report was the first comprehensive attempt at this kind of analysis in many decades and it stood as a landmark study for many years. In slightly more than six months, the CES developed a Report to the Congress and drafted a detailed legislative proposal. "Security was attained in the earlier days through the interdependence of members of families upon each other and of the families within a small community upon each other. The complexities of great communities and of organized industry make less real these simple means of security. Therefore, we are compelled to employ the active interest of the Nation as a whole through government in order to encourage a greater security for each individual who composes it . . . This seeking for a greater measure of welfare and happiness does not indicate a change in values. It is rather a return to values lost in the course of our economic development and expansion . . ."
Franklin D. Roosevelt: Message of the President to Congress, June 8, 1934. In early January 1935, the CES made its report to the President, and on January 17 the President introduced the report to both Houses of Congress for simultaneous consideration. Hearings were held in the House Ways & Means Committee and the Senate Finance Committee during January and February. Some provisions made it through the Committees in close votes, but the bill passed both houses overwhelmingly in the floor votes. After a Conference which lasted throughout July, the bill was finally passed and sent to President Roosevelt for his signature. The Social Security Act did not quite achieve all the aspirations its supporters had hoped by way of providing a "comprehensive package of protection" against the "hazards and vicissitudes of life." Certain features of that package, notably disability coverage and medical benefits, would have to await future developments. But it did provide a wide range of programs to meet the nation's needs. In addition to the program we now think of as Social Security, it included unemployment insurance, old-age assistance, aid to dependent children and grants to the states to provide various forms of medical care. The significance of the new social insurance program was that it sought to address the long-range problem of economic security for the aged through a contributory system in which the workers themselves contributed to their own future retirement benefit by making regular payments into a joint fund. It was thus distinct from the welfare benefits provided under Title I of the Act and from the various state "old-age pensions." As President Roosevelt conceived of the Act, Title I was to be a temporary "relief" program that would eventually disappear as more people were able to obtain retirement income through the contributory system. The new social insurance system was also a very moderate alternative to the radical calls to action that were so common in the America of the 1930s. During the first year, SSB was faced with the tasks of providing employers, employees and the public with information on how earnings were to be reported, what benefits were available and how they were to be provided. In addition, sites for field installations had to be chosen and personnel to staff these offices had to be selected and trained. Operation of the new program was hampered for several months when the budget bill for the Act was killed by a Senate filibuster at the end of August 1935. The new Social Security Board had to borrow money from other federal agencies to operate until January 1936 when the Congress reconvened and passed an appropriation to fund the programs and operations under the Social Security Act. The Social Security Board begin as an independent agency of the federal government. In 1939 it became part of the cabinet-level Federal Security Agency, and in 1946 the SSB was abolished and replaced by the current Social Security Administration. The monumental first task was the need to register employers and workers by January 1, 1937, when workers would begin acquiring credits toward old-age insurance benefits. Since the new Social Security Board did not have the resources available to accomplish this, they contracted with the Post Office Department to distribute the applications. The first application forms were distributed in late November 1936. The numbers were assigned in the local post offices. There is no record of who received the first Social Security number (SSN). The post offices collected the completed forms and turned them over to Social Security field offices located near major post office centers. The applications then were forwarded to Baltimore, Maryland, where SSNs were registered and various employment records established. The first SSN account number record established in Baltimore was assigned to John David Sweeney, Jr. of New Rochelle, New York. Although, John Sweeney received the first SSN account, his was not the lowest number ever issued. That distinction fell to New Hampshire resident, Grace Dorothy Owen. Ms. Owen received number 001-01-0001. Over 30 million SSN cards were issued through this early procedure, with the help of the post offices. By June 30, 1937, the SSB had established 151 field offices, with the first office opening on October 14, 1936, in Austin, Texas. From that point on, the Board's local office took over the task of assigning SSNs. After Social Security numbers were assigned, the first Federal Insurance Contributions Act (FICA) taxes were collected, beginning in January 1937. Special Trust Funds were created for these dedicated revenues. Benefits were then paid from the money in the Social Security Trust Funds. Over the years, more than $8.7 trillion has been paid into the Trust Funds, and more than $7.4 trillion has been paid out in benefits. The remainder is currently on reserve in the Trust Funds and will be used to pay future benefits. From 1937 until 1940, Social Security paid benefits in the form of a single, lump-sum payment. The purpose of these one-time payments was to provide some "payback" to those people who contributed to the program but would not participate long enough to be vested for monthly benefits. Under the 1935 law, monthly benefits were to begin in 1942, with the period 1937-1942 used both to build up the Trust Funds and to provide a minimum period for participation in order to qualify for monthly benefits. The earliest reported applicant for a lump-sum benefit was a retired Cleveland motorman named Ernest Ackerman, who retired one day after the Social Security program began. During his one day of participation in the program, a nickel was withheld from Mr. Ackerman's pay for Social Security, and, upon retiring, he received a lump-sum payment of 17 cents. The average lump-sum payment during this period was $58.06. The smallest payment ever made was for 5 cents! "It is impossible under any social insurance system to provide ideal security for every individual. The practical objective is to pay benefits that provide a minimum degree of social security—as a basis upon which the worker, through his own efforts, will have a better chance to provide adequately for his individual security." -- From the Report of the Social Security Board recommending the changes which were embodied in the 1939 Amendments. The original Act provided only retirement benefits, and only to the worker. The 1939 Amendments made a fundamental change in the Social Security program. The Amendments added two new categories of benefits: payments to the spouse and minor children of a retired worker (so-called dependents benefits) and survivors benefits paid to the family in the event of the premature death of a covered worker. This change transformed Social Security from a retirement program for workers into a family-based economic security program. The 1939 Amendments also increased benefit amounts and accelerated the start of monthly benefit payments to 1940. In 1950 all Social Security beneficiaries received a general "cost-of-living" increase--for the first time since benefits began in 1940. Ida May Fuller is seen here receiving her first increased benefit check on October 3, 1950. Payment of monthly Social Security benefits began in January 1940, and were authorized not only for aged retired workers but for their aged wives or widows, children under age 18, and surviving aged parents. On January 31, 1940, the first monthly retirement check was issued to Ida May Fuller of Ludlow, Vermont, in the amount of $22.54. Miss Fuller, a Legal Secretary, retired in November 1939. She started collecting benefits in January 1940 at age 65 and lived to be 100 years old, dying in 1975. Ida May Fuller worked for three years under the Social Security program. The accumulated taxes on her salary during those three years was a total of $24.75. Her initial monthly check was $22.54. During her lifetime she collected a total of $22,888.92 in Social Security benefits. In mid-August, 1941, Winston Churchill and Franklin Roosevelt met secretly aboard a warship off the coast of Newfoundland in the North Atlantic. On the sixth anniversary of the Social Security Act, they announced a joint-declaration known as the Atlantic Charter. The 383-word Charter was an expression of "certain common principles in the national policies of their respective countries on which they base their hopes for a better future for the world." This brief charter would be the founding document of the United Nations and among its eight principles was a call for social insurance. Former Social Security Board Chairman John Winant was then serving as the U.S. Ambassador to Great Britain. 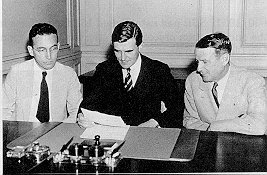 Although Winant did not attend the Conference, the social insurance provision was a suggestion he made from London which was instantly accepted by Churchill and FDR. Although social insurance began in Germany in the 19th century, in the years following World War II the United States was the leading model for nations around the world who were interested in designing Social Security systems. This movement toward the internationalization of Social Security can be symbolically fixed with the issuance of the Atlantic Charter in 1941. From 1940 until 1950 virtually no changes were made in the Social Security program. Payment amounts were fixed, and no major legislation was enacted. There was a significant administrative change in 1946, however, when the three-person Social Security Board was abolished and replaced by the Social Security Administration, headed by a single Commissioner. Because the program was still in its infancy, and because it was financed by low levels of payroll taxation, the absolute value of Social Security's retirement benefits were very low. In fact, until 1951, the average value of the welfare benefits received under the old-age assistance provisions of the Act were higher than the retirement benefits received under Social Security. And there were more elderly Americans receiving old-age assistance than were receiving Social Security. Because of these shortcomings in the program, in 1950 major amendments were enacted. These amendments increased benefits for existing beneficiaries for the first time (see The Story of COLAs), and they dramatically increased the value of the program to future beneficiaries. By February 1951 there were more Social Security retirees than welfare pensioners, and by August of that year, the average Social Security retirement benefit exceeded the average old-age assistance grant for the first time. Most people are aware that there are annual increases in Social Security benefits to offset the corrosive effects of inflation on fixed incomes. These increases, now known as Cost of Living Allowances (COLAs), are such an accepted feature of the program that it is difficult to imagine a time when there were no COLAs. But in fact, when Ida May Fuller received her first $22.54 benefit payment in January of 1940, this would be the same amount she would receive each month for the next 10 years. For Ida May Fuller, and the millions of other Social Security beneficiaries like her, the amount of that first benefit check was the amount they could expect to receive for life. It was not until the 1950 Amendments that Congress first legislated an increase in benefits. 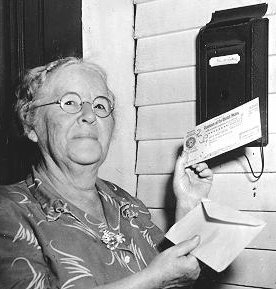 Current beneficiaries had their payments recomputed and Ida May Fuller, for example, saw her monthly check increase from $22.54 to $41.30. These recomputations were effective for September 1950 and appeared for the first time in the October 1950 checks. A second increase was legislated for September 1952. Together these two increases almost doubled the value of Social Security benefits for existing beneficiaries. From that point on, benefits were increased only when Congress enacted special legislation for that purpose. In 1972 legislation the law was changed to provide, beginning in 1975, for automatic annual cost-of-living allowances (i.e., COLAs) based on the annual increase in consumer prices. No longer do beneficiaries have to await a special act of Congress to receive a benefit increase and no longer does inflation drain value from Social Security benefits. * The increase in 3/74 was a special, limited-duration increase. It was effective for only 3/74-5/74. In June 1974, all payment levels reverted to their 2/74 level and the 11% increase was permanently applied on this base. ** The COLA for December 1999 was originally determined as 2.4 percent based on CPIs published by the Bureau of Labor Statistics. Pursuant to Public Law 106-554, however, this COLA is effectively now 2.5 percent. The Social Security Amendments of 1954 initiated a disability insurance program which provided the public with additional coverage against economic insecurity. At first, there was a disability "freeze", (here being signed by President Eisenhower) of a worker's Social Security record during the years when they were unable to work. (First application for disability freeze being filed.) While this measure offered no cash benefits, it did prevent such periods of disability from reducing or wiping out retirement and survivor benefits. On August 1, 1956, the Social Security Act was amended to provide benefits to disabled workers aged 50-64 and disabled adult children. In September 1960 President Eisenhower signed a law amending the disability rules to permit payment of benefits to disabled workers of any age and to their dependents. By 1960, 559,000 people were receiving disability benefits, with the average benefit amount being around $80 per month. The decade of the 1960s brought major changes to the Social Security program. Under the Amendments of 1961, the age at which men are first eligible for old-age insurance was lowered to 62, with benefits actuarially reduced (women previously were given this option in 1956). This created an additional workload for the Agency as more beneficiaries entered the rolls. The number of people receiving disability benefits more than doubled from 1961 to 1969, increasing from 742,000 to 1.7 million. The most significant administrative change involved the signing of the Medicare bill on July 30, 1965, by President Lyndon Johnson In the presence of former President Truman, who received the first Medicare card at the ceremony, Lady Bird Johnson, Vice-President Hubert Humphrey, and Mrs. Truman. With the signing of this bill, SSA became responsible for administering a new social insurance program that extended health coverage to almost all Americans aged 65 or older. Nearly 20 million beneficiaries enrolled in Medicare in the first 3 years of the program. In the 1970s, SSA became responsible for a new program, Supplemental Security Income (SSI). In the original 1935 Social Security Act, programs were introduced for needy aged and blind individuals and, in 1950, needy disabled individuals were added. These three programs were known as the "adult categories" and were administered by State and local governments with partial Federal funding. Over the years, the State programs became more complex and inconsistent, with as many as 1,350 administrative agencies involved and payments varying more than 300% from State to State. In 1969, President Nixon identified a need to reform these and related welfare programs to "bring reason, order, and purpose into a tangle of overlapping programs." In 1971, Secretary of Health, Education and Welfare, Elliot Richardson, proposed that SSA assume responsibility for the "adult categories." In the Social Security Amendments of 1972, Congress federalized the "adult categories" by creating the SSI program and assigned responsibility for it to SSA. SSA was chosen to administer the new program because of its reputation for successful administration of the existing social insurance programs. SSA's nationwide network of field offices and large-scale data processing and record-keeping operations also made it the logical choice to perform the major task of converting over 3 million people from State welfare programs to SSI. In 1972 two important sets of amendments were enacted. These amendments created the SSI program and introduced automatic Cost-of-Living-Adjustments (COLAs). The bill creating the SSI program also contained important provisions for increasing Social Security benefits for certain categories of beneficiaries (primarily aged widows and widowers). It also provided: a minimum retirement benefit; an adjustment to the benefit formula governing early retirement at age 62 for men, in order to make it consistent with that for women; extension of Medicare to those who have received disability benefits for at least two years and to those with Chronic Renal Disease; liberalized the Retirement Test; and provided for Delayed Retirement Credits to increase the benefits of those who delayed retirement past age 65. The separate bill creating automatic COLAs also provided for automatic increases in the earnings subject to Social Security taxes and an automatic adjustment in the wage-base used in calculating benefits. This second adjustment was put in the law as a sort of companion to the COLA. The COLA adjusts for increases in prices, whereas the wage-base adjustment corrects for increases in wages. The purpose of the COLA was to maintain the purchasing power of benefits already awarded. The purpose of the automatic adjustment in the wage base was to maintain the relative value of Social Security benefits for future applicants. Unfortunately, the procedure for adjusting for price and wage increases contained a flaw which resulted in future benefit levels soaring out of control. Indeed, it became apparent that if the trends of the mid-1970s continued, future Social Security beneficiaries could end up receiving more in their monthly retirement benefit than their gross salaries while working. This problem was corrected in the 1977 Amendments. However, the correction led to the appearance of what came to be known informally as "The Notch." The Notch spawned a political protest movement of aggrieved "Notch Babies" who believe they have been the victims of unfair treatment. The main purpose of the 1977 Amendments was to address the financing of the program. Shortly after passage of the 1972 legislation, it became apparent that Social Security faced a funding shortfall, both in the short-term and in the long-term. The short-term problem was caused by the bad economy, and the long-term problem by the demographics associated with the baby boom. By their 1975 report the Trustees said the Trust Funds would be exhausted by 1979. This financing shortfall was addressed by the 1977 Social Security Amendments. These amendments raised the payroll tax slightly (from 6.45% to the current 7.65%), increased the wage base; reduced benefits slightly; and "decoupled" the wage adjustment from the COLA adjustment. These fixes restored the long-term balance of the program for the next 50 years (but not the full 75 years used by the actuaries). It was hoped the amendments would prevent an expected short-term financing problem in the early 1980s. This hope would prove elusive as the major amendments in 1983 would be needed to avoid the short-term problem, and to address the remaining long-range program deficit. The Social Security Amendments of 1980 made many changes in the disability program. Most of these changes focused on various work incentive provisions for both Social Security and SSI disability benefits. The 1980 Amendments also required SSA to conduct periodic reviews of current disability beneficiaries to certify their continuing eligibility. This was to become a massive workload for SSA and one that was highly controversial. By 1983, the reviews had been halted, and in 1984, Congress passed the Disability Benefits Reform Act modifying several aspects of the disability program. From its modest beginnings, Social Security has grown to become an essential facet of modern life. One in seven Americans receives a Social Security benefit, and more than 90 percent of all workers are in jobs covered by Social Security. From 1940, when slightly more than 222,000 people received monthly Social Security benefits, until today, when over 50 million people receive such benefits, Social Security has grown steadily. The SSI program has grown as well from its inception in 1974.
a. Recipients of one-time lump-sum payments. c. Recipients of Federally-administered payments only. d. Includes both Federal payment and Federally-administered State supplementation payments. Throughout the 1980s and 1990s, there was growing bipartisan support for removing SSA from under its departmental umbrella and establishing it as an independent agency. Finally, in 1994 the Social Security Independence and Program Improvements Act of 1994 (P.L. 103-296) was passed unanimously by Congress and, in a ceremony in the Rose Garden of the White House, on August 14, 1994, President Bill Clinton signed the act into law. Contract With America Advancement Act of 1996 (P.L. 104-121). This bill, signed by the President on March 29, 1996, made a change in the basic philosophy of the disability program. Beginning on that date, new applicants for Social Security or SSI disability benefits could no longer be eligible for benefits if drug addiction or alcoholism is a material factor to their disability. Unless they can qualify on some other medical basis, they cannot receive disability benefits. Individuals in this category already receiving benefits, are to have their benefits terminated as of January 1, 1997. Previous policy has been that if a person has a medical condition that prevents them from working, this qualifies them as disabled for Social Security and SSI purposes--regardless of the cause of the disability. Another significant provision of this law doubled the earnings limit exemption amount for retired Social Security beneficiaries, on a gradual schedule from 1996 to 2002. In 2002, the exempt amount will be $30,000 per year in earnings, compared to $14,760 under previous law. The Personal Responsibility and Work Opportunity Reconciliation Act of 1996. This "welfare reform" legislation, signed by the President on 8/22/96, ended the categorical entitlement to AFDC (Aid to Families with Dependent Children) that was part of the original 1935 Social Security Act by implementing time-limited benefits along with a work requirement. The law also terminated SSI eligibility for most non-citizens. Previously, lawfully admitted aliens could receive SSI if they met the other factors of entitlement. As of the date of enactment, no new non-citizens could be added to the benefit rolls and all existing non-citizen beneficiaries would eventually be removed from the rolls (unless they met one of the exceptions in the law.) Also effective upon enactment were provisions eliminating the "comparable severity standard" and reference to "maladaptive behavior" in the determination of disability for children to receive SSI. Also, children currently receiving benefits under the old standards were to be reviewed and removed from the rolls if they could not qualify under the new standards. Omnibus Consolidated Rescissions and Appropriations Act of 1996. Requires that all federal payments (including Social Security and SSI) be made by electronic funds transfer (no more paper checks) effective January 1, 1999, unless a waiver is granted by the Secretary of the Treasury. This massive omnibus spending bill contained SSA's budget as well as numerous legislative changes relating to the SSI program and to issues involved in fighting fraudulent documents in connection with obtaining Social Security numbers. The major SSI provision makes sponsorship agreements legally enforceable for the first time. In the area of identification-related documents, the law requires the establishment of federal standards for state-issued birth certificates and requires SSA to develop a prototype counterfeit-resistant Social Security card. This bill passed the House on 7/30/97 by a vote of 346 to 85, and passed the Senate the next day on a vote of 85 to 15. This law restored SSI eligibility to certain cohorts of non- citizens whose eligibility otherwise would be terminated under the "welfare reform" of 1996. It also extended for up to one year the period for redetermining the eligibility of certain aliens who may ultimately not be eligible for continued benefits. From the very beginning, the Social Security program has had the services of periodic Advisory Councils composed primarily of non-government members whose function was to represent the public at large in advising government officials on Social Security policy. The first such Advisory Council was convened in 1934 in support of the work of the Committee on Economic Security. Over the years, the Advisory Councils have been very influential in setting the agenda for changes in Social Security. The Councils were especially influential in shaping the pivotal 1939 and 1950 amendments. Eventually, the tradition of periodic Social Security Advisory Councils was made a standard provision of the law, with a requirement that such a Council be appointed every four years. This law stayed in effect until 1994, when it was repealed as part of the legislation which made SSA an independent agency. The 1994-1996 Advisory Council was thus the final Council, signaling the end of a long tradition in Social Security. Under that 1994 law, the Councils are abolished and a permanent 7-member Advisory Board was formed to serve many of the same functions. On December 17, 1999 the President signed the "Ticket to Work and Work Incentives Improvement Act of 1999"--one of the most significant changes in disability policy in the last 20 years. This law creates a Ticket to Work and Self-Sufficiency Program which will provide disability beneficiaries with a ticket they may use to obtain vocational rehabilitation services, employment services, and other support services from an employment network of their choice. In addition to allowing beneficiaries to purchase vocational services, the law provides incentive payments to providers for successful rehabilitation in which the beneficiary returns to work. The new provisions also provide a number of safeguards to the beneficiaries to protect their benefits and health Taken together, the Ticket to Work initiative seeks to shift the emphasis in the disability program away from mere maintenance of benefits more toward rehabilitating the disabled and assisting them in returning to productive work. The legislation began its swift march through Congress on March 1, 2000 when the full House of Representatives passed H.R. 5 by a vote of 422 to 0. The Senate, on March 22, 2000 then passed the bill by a vote of 100-0 (with a technical amendment). On March 28, 2000 The House agreed to the Senate amendment by a vote of 419-0 and cleared the measure for transmission to the President. This was a historic change in the Social Security retirement program. From the beginning of Social Security in 1935, retirement benefits have been conditional on the requirement that the beneficiary be substantially retired. This requirement was carried out by the provisions of the RET. The RET has changed considerably over the years. The requirement was first scaled-back in the 1950 Amendments, which exempted workers age 75 and older from the RET. The exempt age was reduced to 72 in 1954, and to age 70 and older in 1977. With the new legislation, starting at the NRA, Social Security retirement benefits will be paid to beneficiaries who are still working. Effectively, for those who have reached full retirement age, this repeals the requirement that the beneficiary be substantially retired in order to receive full Social Security retirement benefits. It must preserve the benefits of all current retirees and those nearing retirement. It must return Social Security to sound financial footing. And it must offer personal savings accounts to younger workers who want them. On May 2, 2001 the President announced the appointment of his Social Security Commission, the "President's Commission to Strengthen Social Security." The Commission issued its final report in December 2001. At the beginning of his second term, President Bush made it clear that Social Security reform would be a top priority of his Administration. Although the President pushed for major changes in Social Security, none were enacted into law during the President's second term. P. L. 107-117 (H.R. 3338) was signed into law on January 10, 2002. This law eliminated deemed wage credits for members of the uniformed services for all years after calendar year 2001. P.L. 107-171 (H.R. 2646) the Farm Security and Rural Investment Act of 2002 was signed into law on May 13, 2002. The law provides Federal funding of up to $5 million for each fiscal year 2003-2007 for access and outreach pilot projects. The law also restored eligibility for food stamps for all legal immigrant children; restored food stamp eligibility for qualified alien adults who are receiving disability benefits; and provides food stamp eligibility to any otherwise eligible qualified aliens who have continuously resided in the United States for 5 years or more. A major change in the Medicare program was enacted into law during this period. P.L. 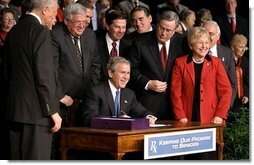 108-173, the Medicare Prescription Drug, Improvement, and Modernization Act of 2003 (H.R. 1), was signed into law on December 8, 2003. The law amends title XVIII of the Social Security Act to provide for a voluntary prescription drug benefit under the medicare program. This was the largest single expansion of the Medicare system since its creation in 1965. On February 17, 2009, the President signed H.R. 1, the "American Recovery and Reinvestment Act of 2009" (Public Law 111-5). This law appropriated an additional $1 billion to the Social Security Administration's administrative budget, $500 million of which is to be used to replace the National Computer Center, and the information technology costs associated with such Center; and $500 million for processing disability and retirement workloads, including information technology acquisitions and research in support of such activities. The bill also provided special a one-time economic recovery payment of $250 to adults who were eligible for benefits from one of the four following Federal benefit programs: Social Security, Railroad Retirement, Veterans Disability, and Supplemental Security Income (SSI). On September 18, 2009, the President signed into law H.R. 3325, the “" which became Public Law 111-64. This legislation extends, through fiscal year 2010, funding authorization for the Work Incentives Planning and Assistance program and the Protection and Advocacy for Beneficiaries of Social Security program. On December 15, 2009, President Obama signed H.R. 4218, the “No Social Security Benefits for Prisoners Act of 2009”, which became Public Law 111-115. The bill prohibits the payment of any retroactive Title II and Title XVI benefits to individuals while they are in prison, are in violation of conditions of their parole or probation, or are fleeing to avoid prosecution for a felony or a crime punishable by sentence of more than one year. To assist students and other researchers we have grouped the reference sources into three categories: Classic Sources, which are the earliest published works and which are likely to be out-of-print and available only in larger libraries; Academic Treatments, which is meant to indicate a more scholarly approach to the subjects, and may be more suitable for advanced students and in-depth researchers; and Popular Accounts, which are works that seem suitable for a broad general audience. These categories are arbitrary, imprecise, and flexible. They are intended as a rough guide only and should not be taken too literally. Armstrong, Barbara, "Insuring the Essentials," Macmillan Co., 1932. A scholarly review of the state of social insurance efforts as they stood in the early 1930s, by one of the principal designers of Social Security's old age insurance program. Epstein, Abraham, "Insecurity: A Challenge to America," Third Revised Edition, Harrison Smith and Robert Haas, 1936. A classic study of social insurance, with one of the first published critiques of the recently passed Social Security Act by a critic who believed the Act did not go far enough in addressing the need for social insurance programs. Rubinow, I. M., "Social Insurance: With Special Reference to American Conditions," Henry Holt, 1913. Rubinow, I. M., "The Quest for Security," Henry Holt, 1934. Rubinow's two books were the most influential on early thinking regarding social insurance. President Roosevelt, in particular, was an admirer of Rubinow's work. Seager, Henry, "Social Insurance: A Program of Social Reform," Macmillan Co., 1910. Believed to be the first American work on social insurance. Chambers, Clarke, "Seedtime of Reform: American Social Service and Social Action 1918-1933," University of Minnesota Press, 1963. In-depth discussion of events in the period leading up to the creation of Social Security. Katz, Michael B., "In The Shadow of the Poorhouse: A Social History of Welfare in America," Tenth Anniversary Edition, Basic Books, 1996. An outline of the development of American social policy from the earliest days. Lubove, Roy, "The Struggles for Social Security: 1929-1935," Harvard University Press, 1968. Mitchell, Daniel J.B., "Pensions Politics and the Elderly: Historic Social Movements and Their Lessons for Our Aging Society," M.E. Sharpe, 2000. A discussion of the Townsend Plan, the Ham and Eggs movement, and other alternative pension movements in California. Skocpol, Theda, "Protecting Soldiers and Mothers," Harvard University Press (Belknap), 1992. Source for information on Civil War pensions, Mothers pensions, and early workmen's compensation efforts. Schlesinger, Jr., Arthur M., three volumes: "The Crisis of the Old Order," "The Politics of Upheaval" and "The Coming of the New Deal." Houghton-Mifflin, The American Heritage Library, 1988. This is the classic history of this period. Weaver, Carolyn, "The Crisis in Social Security: Economic and Political Origins," Duke Press Policy Studies, 1982. Contains an account of historical developments from prior to 1900 through the Social Security amendments of the early 1970s. Brinkley, Alan, "Voices of Protest: Huey Long, Father Coughlin and The Great Depression," Vintage Press, 1983. A good overview of Long and Coughlin. Kennedy, David M., "Freedom From Fear: The American People in Depression and War, 1929-1945." Oxford University Press, 1999. The early chapters in this book contain a good summary of the period right before the Depression through the passage of Social Security. McElvaine, Robert S., "The Depression and New Deal: A History in Documents." Oxford University Press, 2000. This books has lots of photos and short essays and is easy to read. Mitchell, Greg, "The Campaign of the Century," Random House, 1992. This is the most comprehensive account of Upton Sinclair's EPIC Plan. Watkins, T. H., "The Great Depression: America in the 1930s," Back Bay Books, 1993. Lots of photos and short essays. Watkins, T. H., "The Hungry Years: A Narrative History of the Great Depression in America," Henry Holt, 1999. A more in-depth account of this period. Cohen, Wilbur, and Haber, William, (eds.) "Readings in Social Security," Prentice-Hall, 1948. A collection of essays by a wide variety of authors on the history, philosophy and major policy issues in the development of Social Security. Cohen, Wilbur, and Haber, William, (eds.) "Social Security: Programs, Problems, and Policies," Richard D. Irwin, 1960. Similar to their earlier book, with a bit more emphasis on policy issues, and bringing the discussion current through the passage of the 1960 amendments. Frase, Robert and McKinley, Charles, "Launching Social Security: A Capture and Record Account 1935-1937," University of Wisconsin Press, 1970. A detailed academic exercise in which two political scientists recount the implementation of the new Social Security program in its first years. Primarily an administrative history. Perkins, Frances, "The Roosevelt I Knew," Viking Press, 1946. Memoir of Miss Perkins' role in the Roosevelt Administration, with a chapter on the development of the Social Security Act. Social Security Board, "Social Security in America," Social Security Board, 1937. Summary of the research developed by the Committee on Economic Security that underlay the Social Security Act. Achenbaum, Andrew, "Social Security: Visions and Revisions," Cambridge University Press, 1986. Review of the political and policy development of the Social Security Act, up through the 1983 amendments. Berkowitz, Edward D., "Disabled Policy: America's Programs for the Handicapped" Cambridge University Press, 1987. A review of workmen's compensation and the disability benefits program of the Social Security Act. Berkowitz, Edward D., (ed.) "Social Security After Fifty," Greenwood Press, 1987. Proceedings of an academic conference held at George Washington University in 1986. Berkowitz, Edward D., "America's Welfare State: From Roosevelt to Reagan," Johns Hopkins University Press, 1991. A review of developments in Social Security, welfare reform and health insurance since the passage of the Social Security Act. Berkowitz, Edward D., "Mr. Social Security: The Life of Wilbur Cohen," University Press of Kansas, 1995. A biography of one of the important pioneers of Social Security and an account of the historical developments in which he participated, with a special emphasis on the development of the Medicare program. Derthick, Martha, "Policymaking for Social Security," Brookings Press, 1979. A political scientist surveys the political and administrative development of the Social Security program up through the early 1970s. Derthick, Martha, "Agency Under Stress: The Social Security Administration in American Government," Brookings Press, 1990. A political scientist reviews the administration of the disability and SSI programs. Nash, Gerald; Pugach, Noel; and Tomasson, Richard (eds. ), "Social Security: The First Half Century," University of New Mexico Press, 1988. Proceedings of an academic conference held at the University of New Mexico in 1985. Tynes, Sheryl, "Turning Points in Social Security: From 'Cruel Hoax' to 'Sacred Entitlement'," Stanford University Press, 1996. A critical history of the development of Social Security up through the early 1980s. Altmeyer, Arthur, "The Formative Years of Social Security," University of Wisconsin Press, 1968. Chronicle of the development of Social Security from 1934-1954 from a major figure in this history. Ball, Robert, "Insuring the Essentials: Bob Ball on Social Security," Century Foundation Press, 2000. A collection of historical and policy essays by a former Commissioner of Social Security. Bellush, Bernard, "He Walked Alone: A Biography of John Gilbert Winant," Mouton, 1968. Biography of the first Chairman of the Social Security Board. Coll, Blanche, "Safety Net: Welfare and Social Security 1929-1979," Rutgers University Press, 1995. A readable history of the welfare provisions of the Social Security Act. Davis, Kenneth, "FDR: The New Deal Years," Random House, 1986. Contains an extended chapter on the development of the Social Security Act. Eliot, Thomas, "Recollections of the New Deal," Northeastern University Press., 1992. Memoir of the lawyer who helped draft the legislative language for the Social Security Act in 1935. Light, Paul, "Artful Work: The Politics of Social Security Reform," Random House, 1985. And "Still Artful Work: The Continuing Politics of Social Security Reform," McGraw-Hill, 1995. A history of the Greenspan Commission and the development of the 1983 amendments. Myers, Robert J., "Within the System: My Half Century in Social Security," Actex Publications, 1992. An autobiography of the Social Security actuary who started with the Committee on Economic Security in 1934 and eventually became SSA's Chief Actuary. Schlabach, Theron, "Edwin Witte: Cautious Reformer," State Historical Society of Wisconsin, 1969. Interesting biography of a key figure in the creation of the Social Security program. Witte, Edwin, "The Development of the Social Security Act," University of Wisconsin Press, 1963. A contemporary memorandum on the behind-the-scenes development of the Social Security Act.